Where might you integrate media and digital literacies when using mobile learning tools? 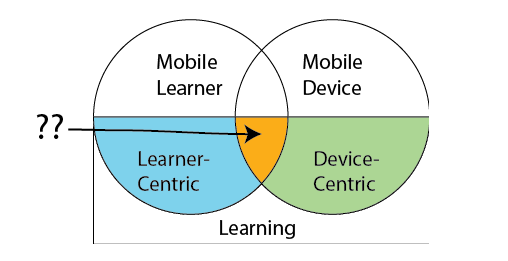 What are some characteristics of mobile learning? 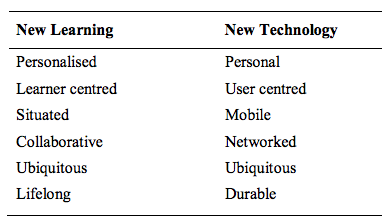 How does mobile technology shift teaching and learning? that transcend barriers of age and culture." With this understanding, that mobile technologies will continue to transform learning, it is critical to examine how, where, when and, most importantly WHY technology is integrated into teaching and learning landscapes. With this ever-evolving and ever-changing set of tools and resources, how can educators manage mobile technology in their classrooms? How might learning and teaching shift to new ways of knowing? Let's take a look at some favourite or familiar mobile technologies impacting education and examine the WHY? Why use them and why do they shift learning? In her article "An inclusive definition of mobile learning" Rebecca J. Hogue presents an image of mobile learning that integrates the learner with the device. She asks what the intersection of learner centric and device centric should be called. Where does the learning truly take place? How can educators ensure that the device does not pull the learner off center? Mobile learning is expanding educational opportunities around the world. UNESCO holds and annual Mobile Learning Week (2018 sessions are listed here) in efforts to support the growing need for conversations about mobile learning. Opportunities for teacher development and empowering women, disenfranchised and impoverished populations are some of the reasons mobile learning is a growing area of research. We have more computing power in our pockets than NASA had for the moon landing - learn more from this article about Francois Taddei. Working on the UNESCO Sustainable Development Goals (Teach SDGs) is one way to integrate mobile, inquiry learning into your classrooms. Planning and participating in Citizen Science projects is another great inquiry based way to make learning mobile friendly. Lets connect the idea of mobility to forms of assessment - shifting how you know students have acquired 'knowledge' and can demonstrate their learning. Google Forms is one tool/resource that can support the mobile shift in assessment. Taking time to tinker with another mobile technology - REMIND. Read more about this communication tool from the Remind BLOG. Learn more from the REMIND YouTube playlist. Link to learn more about some apps used by educators. Links to other great lists of apps for educators. Also check out EdShelf where apps are reviewed by users for users. Follow EdShelf on Twitter. How do mobile technologies change how students can engage in media and digital technologies? Why are literacy lessons essential when mobile tools are used in the classroom?